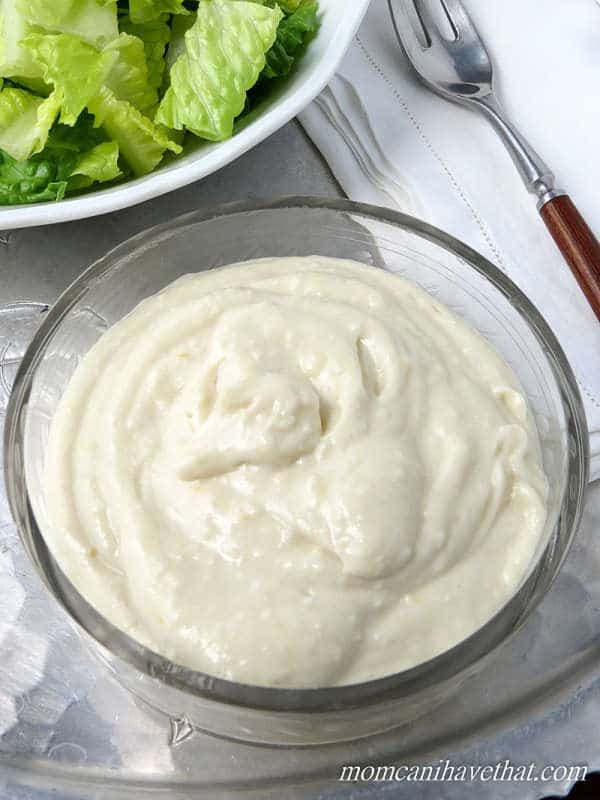 Easy low carb Caesar salad dressing or dip that’s salty, lemony & pungent with garlic, hitting all of the right places on the tongue. Try on vegetables too. Low Carb Caesar Salad Dressing – The Best Dressing! I often have a salad for lunch. Salads are great for those of us on low carb diets because they are low in carbs and help fill you up. A terrific grilled chicken Caesar salad is my trusty “go-to” when ordering out. With so many salad dressing choices low in fat and high in sugar, I know a Caesar salad dressing will be a great low carb choice. What Does Caesar Salad Dressing Taste Like? What does a good low carb Caesar salad dressing taste like? It’s salty, pungent with garlic, and full of umami flavors from ingredients like anchovies, Worcestershire sauce and Parmesan cheese. I add a hit of lemon to mine because lemon is awesome. Do anchovies make you nervous? Me, too. Luckily, you can’t taste them in most Caesar dressings. There are basically two ways to make Caesar salad dressing. Traditional Caesar Salad Dressing: A thick vinaigrette dressing made from oil and vinegar using a Dijon mustard “cheat” and egg yolk to help the process along. Minced garlic and anchovy fillets are mashed together and whisked with Dijon mustard, an egg yolk and vinegar. Then, oil is added in a thin stream as the dressing is whisked continuously until an emulsion forms. 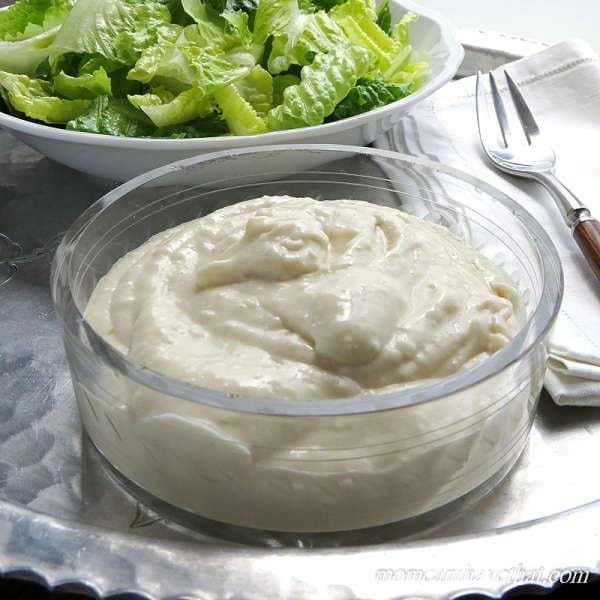 Creamy Caesar Dressing: The making of a homemade mayonnaise results in a creamy dressing. It’s easiest to use a blender. Add egg yolks and oil to a blender. Blend on low to form the mayonnaise. Add lemon juice, vinegar, anchovies (or paste) and garlic. Blend to incorporate the ingredients. I’ll share an easier method for making a great low carb Caesar salad dressing. I’m a busy mom, and not beyond taking a shortcut when I can. How to Make Low Carb Caesar Salad Dressing the Easy Way! So, what’s the easiest way to make a creamy Caesar salad dressing? Use prepared mayonnaise! Eliminating the blender allows you to “whip this up” literally in minutes. Most of the ingredients are regularly found in the home and the anchovy paste can be found in the grocery store in the tuna aisle. It comes in a convenient tube which I keep in my refrigerator drawer. How do you do it? Just mix the ingredients into the mayonnaise and enjoy! That’s it! 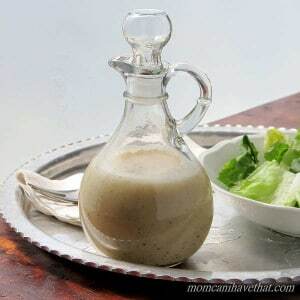 Easy Low Carb Caesar Salad Dressing is 1 net carb per 3 TBSP. Easy low carb Caesar salad dressing or dip that's salty, lemony & pungent with garlic, hitting all of the right places on the tongue. Try on vegetables too. Add the anchovy paste and Dijon mustard to a 2-4 cup capacity bowl. Mix until smooth with a whisk or a fork. On a cutting board, smash the clove of garlic with a large kitchen knife and peel. Chop the garlic a few times, then add the 1/4 teaspoon of salt. The salt will help in the process of mincing the garlic and turning it into a paste. Now, scrape the garlic together into a pile and turning the knife sideways, scrape the garlic/salt against the cutting board several times making a paste. Add the garlic paste to the bowl and blend. Add the worcestershire and vinegar, stirring into the mixture. Add the mayonnaise, lemon juice and lemon zest. Stir until combined. Lastly, add the Parmesan cheese and blend. Taste and adjust the seasoning.. The flavor of this easy Lemon Caesar Dressing develops more fully over-night and is even better the next day. Makes a little over 1 cup with a serving size of 3 tablespoons. Just getting into Keto. 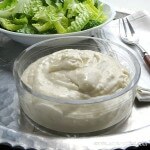 Read your article on Caesar dressing, I’ll be giving it a go soon. Any clues on an alternative to crackers (biscuits) to have with cheese, dips or pate? I absolutely ADORE Caesar Dressing, but here in Holland it costs an arm and a leg! How long can I refrigerate this? ** I origianlly wrote this at 3AM when I couldn’t sleep and edited it after sleeping a little. I wouldn’t let it stay in the fridge for 2 weeks but 7-10 days max, with 7 being more prudent. Thanks for the info. I’ll also try freezing a small portion, just to see if it keeps well.